The authority consists of seven indirectly elected constituent members, each a directly elected councillor from one of the seven West Midlands county local authorities, as well as the Mayor of the West Midlands who is directly elected by the county's residents. There are currently thirteen non-constituent members, made up of three Local Enterprise Partnerships as well as ten local authorities from outside of the West Midlands county. There are also four 'observer organisations' (organisations awaiting non-constituent membership and non-voting observers). The abolition of the West Midlands County Council in 1986 left the county without a single authority covering the whole area, although some council functions continued to be provided jointly, through the West Midlands Joint Committee, the West Midlands Integrated Transport Authority, West Midlands Police (initially under the oversight of the West Midlands Police Authority and currently overseen by the directly elected West Midlands Police and Crime Commissioner) and West Midlands Fire Service. The authority has previously (incorrectly) been referred to as the Greater Birmingham Combined Authority, or simply Greater Birmingham, as the final model and membership was worked out and negotiated. Greater Birmingham is a term present in the current Local Enterprise Partnership which serves Birmingham, Solihull and some additional local council areas within the West Midlands. The authority's initial priorities will involve co-ordinating the city-region to act as one place on certain issues, such as international promotion and investment; reforming public services such as mental health services; and improving internal and external transport links. Transport for West Midlands (TfWM) is an executive body of the WMCA that oversees transportation (road, rail, bus and Metro) within the metropolitan county. The organisation carries over the previous responsibilities of Centro (the West Midlands Passenger Transport Executive). TfWM has a similar level of responsibility to Transport for London - although its responsibility with highways is limited to a defined set of major routes (the West Midlands Key Route Network). TfWM's policies and strategy are set by the WMCA's transport delivery committee. Transport for West Midlands operates the West Midlands Metro tram system, and is currently expanding the system from Birmingham City centre to Birmingham Airport, and to the west to Brierley Hill via the Merry Hill Shopping Centre. Metro extensions are planned and constructed through the Midland Metro Alliance, of which TfWM is a member. TfWM is also looking at improvements to the M5 and M6 motorways, and new cycles routes as part of a metropolitan cycle network. There are also plans to work with central government over the future of the underused M6 Toll. The WMCA has the ability to create a regional spatial development strategy, similar to the London Plan and the Greater Manchester Spatial Framework. While local planning will remain in the hands of the seven boroughs, the WMCA will be able to analyse county-wide brownfield sites and decide where new homes should be built. A mental health commission was formed in order to create a reformed mental healthcare system in the county. The WMCA will not, however, have control over a devolved NHS budget as is the case in Greater Manchester. In 2017, the West Midlands, like several other city regions, elected a 'metro mayor' with similar powers to the Mayor of London. The date of the first mayoral election was 4 May 2017. The election was won by Andy Street of the Conservative Party, with 50.4% of the votes in the second round. A directly-elected mayor for the combined authority area was described as 'inevitable', as such a role has been stated as a conditional requirement for a more powerful devolution deal. The WMCA shadow board submitted proposals for a combined authority with and without a mayor leader, and decided which plan of action to take based on the devolution proposals from the government for each. Powers sought for a regional metro mayor and the WMCA were first revealed in a leaked bid document first reported by Simon Gilbert, of the Coventry Telegraph. Those powers included the ability of the mayor to levy extra business rates from companies in the region. Negotiations also included the desire to take away the ability of local councils to retain future business rates growth and to hand that cash to the WMCA, who would decide how it was spent across the region instead of by individual local authorities. ^ "Committee details". West Midlands Combined Authority. Retrieved 4 December 2017. ^ "Councillor Bob Sleigh". West Midlands Combined Authority. Retrieved 4 December 2017. ^ "Deborah Cadman appointed new WMCA chief executive". West Midlands Combined Authority. Retrieved 3 December 2017. ^ "SI/SR Template" (PDF). Retrieved 10 August 2016. ^ "Combined Authority". Solihull MBC. Retrieved 31 December 2016. ^ "CONSTITUTION OF THE WEST MIDLANDS COMBINED AUTHORITY" (PDF). Retrieved 4 December 2017. ^ "WMCA Interactive Chart". Retrieved 3 December 2017. ^ "Business groups give backing to 'Greater Birmingham' combined authority". Birmingham Mail. 1 October 2015. Retrieved 11 October 2015. ^ "West Midlands Combined Authority is such a dismal title – you would expect no less from a committee". Birmingham Mail. 18 June 2015. Retrieved 11 October 2015. ^ "Greater Birmingham councils bid for £8 billion devolution deal". Birmingham Mail. 5 September 2015. Retrieved 11 October 2015. ^ "Greater Birmingham and Solihull LEP". Retrieved 21 September 2017. ^ "Launch Statement" (PDF). West Midlands Combined Authority. July 2015. Retrieved 25 January 2016. ^ "Centro to be abolished as WMCA takes charge of transport « Chamberlain Files". thechamberlainfiles.com. Retrieved 28 October 2015. ^ Transport, Transport for West Midlands: Transforming Public. "Transforming Public Transport". Transport for West Midlands. Retrieved 28 July 2018. ^ WMCA Devolution Agreement: Key Points. West Midlands Combined Authority. ^ Gilbert, Simon (12 May 2016). "Date of election to choose Greater Birmingham mayor". Coventry Telegraph. Retrieved 12 May 2016. ^ "Mayor of the West Midlands". Retrieved 3 December 2017. ^ Elkes, Neil (16 June 2015). "Elected Mayor for West Midlands by 2019 according to council leaders group". Birmingham Mail. Retrieved 7 September 2015. ^ "Dale's Devo Diary: West Midlands hatches 'to be or not to be' Metro Mayor plan". Retrieved 28 July 2015. ^ "Revealed: Leaked document shows full details of West Midlands 'super council' bid". Simon Gilbert. Coventry Telegraph. 25 September 2015. Retrieved 23 October 2015. ^ "Leadership". www.westmidlandscombinedauthority.org.uk. West Midlands Combined Authority. Retrieved 12 March 2017. ^ Covers Dudley, Sandwell, Walsall and Wolverhampton. 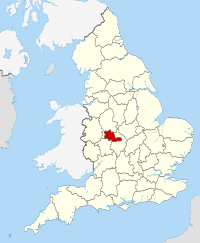 ^ Covers Coventry, North Warwickshire, Nuneaton and Bedworth, Rugby, Stratford-upon-Avon and Warwick. ^ "Tim Pile". Retrieved 3 December 2017. ^ Covers Herefordshire, Shropshire and Telford and Wrekin.